One of the benefits with using plywood sheets is their size—dimensions of plywood in the US normally come in 4’ x 8’ sheets (125 x 250 cm metric). For larger-scale projects with significant surface area to cover such as roofs and subflooring, plywood sheets make quick work of covering these large areas. The size of plywood sheets can also be a liability if/when those sheets need to be cut to fit properly. Large cabinet shops have powerful table saws with infeed and outfeed tables large enough to land small aircraft, or so it seems, and easily support the size and weight of these plywood sheets before, during and after the cut. These table saws easily allow for a one-man operation. 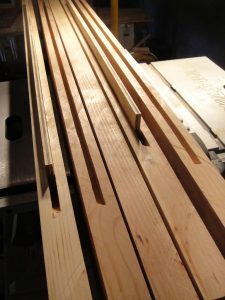 Typical job sites, on the other hand, might have only a small, portable table saw—one whose infeed/outfeed tables lack the necessary support tables to adequately handle such large sheets of plywood. In situations like that, there are alternatives to using a table saw to make long or angled cuts in plywood. For long and straight cuts, the easiest method to cut a piece of plywood is to clamp a straightedge to the plywood and cut along the straightedge with a circular saw. This requires knowing the distance from the edge of the saw to the sawblade itself—don’t forget to account for the width of the sawblade as well, if necessary. Commercially available clamped straightedges come in a variety of sizes and systems; naturally this variety also comes with a significant range in prices. Entry-level systems of this type begin around $35-40 (~30€). They contain an adjustable clamp that locks on either end of the piece of plywood you’re trying to cut. Once fastened in place, your saw edge tracks along the side of the clamp for an accurate, fast and reliable cut. These low-priced entry tools have limited length (24” or 60 cm). More advanced systems, which can run upwards of $901–160 (80–150€) have the necessary length to cut the long edge of a piece of plywood and come with an attachment for your saw that tracks the clamp itself. Systems like this offer incredible precision and ease of use. For the budget conscious, one can accomplish the same cut in a much less expensive way by simply clamping a straight board on top of the plywood piece to be cut. This system requires the top board be perfectly straight for the best cuts and the clamping may be done with two 6” bar clamps (15 cm) which are available at most home centers for $5/each. For cutting solutions that involve angles, however, the expensive clamp systems don’t work as well. These systems require a perpendicular edge for the clamps to exert maximum clamping pressure and stability to the cut. If you need to make a cut like the one shown on the right, where the portion to be removed is shown as a dashed line, it doesn’t matter whether you’re using 1 x 12” boards or one solid piece of plywood, the angled cuts prevent these clamping systems from getting the necessary grip to make an accurate cut. Short of using a sharp, well-tuned handsaw to make these angled cuts by hand, the only way to do this accurately and easily is to use the bar clamps and a straight board clamped at the appropriate angle for the roof gable. That angle is calculated using the roof pitch, the height of the roof over half of the length. To make that gable cut in a piece of plywood, you would measure the roof gable height and half of the roof length. If you recall your trigonometry, you’ll know that the correct angle would be tan–1(height/half-length). For example, for a roof seven feet tall by 24 feet long (2.13 m x 7.31 m) has an angle of approximately 30°–tan–1(7/24). Using an angle finder, you would mark out the appropriate angle on the board to be cut, using a factory edge as a reference guide. Once the cutline had been established, you would place the clamps on the board the appropriate distance to allow the saw to track properly. However, not many people recall their trig, or actively seek to bury that knowledge. To calculate the angle of the cut properly without resorting to a scientific calculator, you would use a framing square to set the initial angle and a straightedge to complete it. This method is used more commonly when cutting or setting out rafters, but can be extended to an entire gable end. For a more complete guide for setting out angles using a framing square, see the following article.